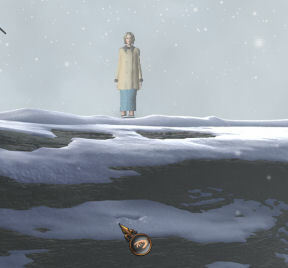 Gameplay: This is a third person point and click game. CD2 is needed to be in the drive to play. The main menu has play (new game), load game, options, credits and exit. The options menu has the music, volume, effects volume, brightness, text captions, 3D shadows, animated effects, fog-haze-clouds effects, particle effects and antialiasing. Move the cursor to the top of the screen to access the taskbar. The taskbar has access to in game menu at right and the inventory on the left side of the taskbar. A map of the train is seen in the middle of the taskbar. Click on a lit section of the train will transport you to that place. The in game menu is accessed also by ESC key or right of the taskbar. It has resume game, save game, load game, options and main menu. To save game, you can use the time-date that is the default or name the saved game yourself before clicking the OK button. The saves can also be overwritten. 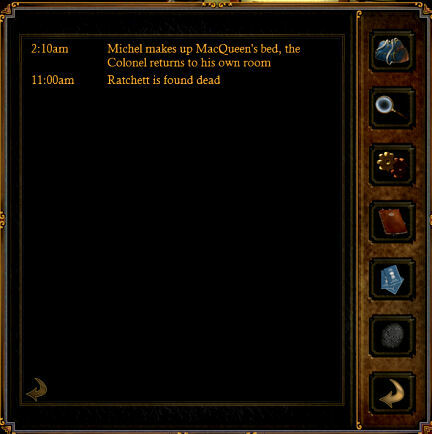 The inventory menu is accessed by right mouse click or click on the inventory icon at top left part of the screen. There are scroll arrows at top corners to see all the items. There are 7 buttons on the side of the frame. The inventory button shows the items taken. Click-drag an item and place it over the magnifying glass icon: a description of the item is given. This gives additional clues to the gameplay. Also, when book, letters and newspaper clippings are examined this way, the information is stored in the scrapbook. The gears button is used to combine objects together or separate items. To combine items together, click-drop an item to one of the assembly slots found at left side of the frame. Place the next item on another empty slot. When all items needed are on their individual slots at left side, click on the gear button to combine them. The new item is seen on the right side. Click on the new item to place it in inventory. To separate an item, place the item on the first assembly slot and then click on the gears button. The scrapbook button accesses the document information gathered. The passport button accesses the passport information of different characters gathered during gameplay. The fingerprint button is where the fingerprints collected during gameplay are stored. Exit button closes the inventory menu. The intro and cutscenes can be skipped using the ESC key. The dialogues can be hastened by left mouse click. Double click on the footprints at end of frames hastens transition to next screen. New Paltz, NY 1924: See cops surround a house. After the gunfire spray, 2 men surrender. Istanbul, Turkey 1934: Antoinette Marceau was given the order by Marcel Bouc, the Director of Train Company to take in charge, secure compartment and do what ever the wishes of Hercule Poirot the great detective. The only item in inventory is Antoinette's train ticket. The scrapbook has True Crime Stories. The passport has Antoinette's passport. Catch up to Hercule Poirot: Click on Poirot to follow him through the market outside the Sirkeci station. Chef Klaus blocks the path - The path is blocked by an angry chef. Talk to the chef and he will ask you to decide which is the better cleaver. Select the one on his left hand. Follow Poirot to the corner with a man in brown coat talking to a vendor. 2 men block the path - The 2 men (Mr. Foscarelli and Mr. Hardman) are discussing which the better tile (Kutahya or Iznik) here in Turkey. Talk to them, they will not move until you get a sample of the pottery. Go back 2 screens and go to the stall with a man wearing a brown coat. Take the Kutahya bowl from the table. Go back to the 2 men and talk to them. Automatically give the bowl. They move off the path. Take the grain on the cart at left. Continue down the path. 2 women block the path - Talk to Princess Dragomiroff and Miss Schmidt. They want you to find the Princess' parasol. Go back to the goat. Give him the grain to move him to the side. Take the elegant parasol. Go back to the 2 ladies and talk to them. Automatically give the parasol. Greta Ohlsson - Talk to the woman that wants you to show her the way to the station. Go through the dialogues. She follows you on your chase. 2 men block the path - Talk to Ratchett and MacQueen. They talk about a statue. Enter the Sirkeci Station and go left until you see Hercule Poirot eavesdropping on the conversation of a man and a woman (Col. Arbuthnot and Miss Mary Debenham). Ticket man - Continue to follow Poirot until the ticket man. Talk to the ticket man and automatically give him the train ticket to get a ticket stub. Miss Ohlsson is left behind. Continue forward. Train attendant Pierre Michel - See the train attendant and Poirot discuss his train accommodation. The train is full and there's no cabin for Poirot. The train manifest and train map is placed in the scrapbook. Talk to Michel, the conductor and then to Poirot. Talk to the attendant again until it is decided that Antoinette will give Poirot her cabin and she will stay with Miss Ohlsson. NOTE: This game is non linear. This walkthrough follows the solutions based on the M. Poirot's instructions. Be sure to check all items in inventory using the magnifying lens icon. 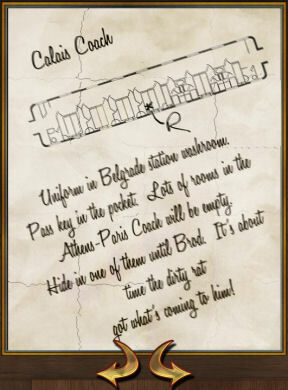 Check the scrapbook to follow M. Poirot's instructions and other information that can give clues on how to proceed. The train departs for Belgrade. Listen to the passengers. Talk to Hercule Poirot during dinner completely and learn about the different characters on board. Ratchett talks to Poirot about hiring him. His life has been threatened. He shows his gun. Find the bacon: Chef Klaus is upset because his shipment of bacon is not here in Belgrade. Antoinette exits the train in Belgrade. Go forward and see a train attendant climb aboard the train. Go forward until 2 men by the fountain. Talk to Arbuthnot and MacQueen. Continue right and see a woman leave the bench. Click on the gate by tree, Antoinette makes a comment about the train attendant. Continue to the front of the train. Talk to train attendant Michel and Tayyip, the Engineer. A Greek physician joined the train here. Go to the left and see boxes on a cart. Look at the boxes and see that they are in Serbian. Go back to Michel and talk to him about reading the boxes. Click on the box at right to find Klaus' bacon. Antoinette remembers Poirot's words. Go to the next car at top end of the hall, the Salon car. Go forward to the bar. Go behind the bar and take the ice tongs and 5 water glasses that are thin. Open the drawer and take the sellotape and the paper napkins. Go back to the Calais car by walking there or place the cursor at top of screen. See the different cars of the Orient Express. Click on the lit Calais coach to immediately be in that car. Cabin 1-2 (Masterman & Foscarelli) - Hear Antonio Foscarelli, the Italian and Cyrus Hardman, the American talk about Masterman while he absent. Cabin 3-4 (MacQueen) - Hear Hector MacQueen, the young American and Colonel Francis Arbuthnot talk about politics. Cabin 5-6 (Schmidt - Debenham) - No sound. Miss Mary Debenham must be sleeping and Hildergard Schmidt is with the Princess. Cabin 9 - (Poirot) - No sound. Poirot must be sleeping. Cabin 10 (Ratchett) - Hear Ratchett and Masterman talk about what Ratchett is reading. Cabin 11 (Hubbard) - No sound. Mrs. Caroline Hubbard, the American is sleeping. Cabin 12 (Countess Andrenyi) - Listen to Count Rudolf and Countess talk about nightmare. Cabin 13 (Count Andrenyi) - No sound. The Count is next door with the Countess. Cabin 14 (Princess Dragomiroff) - Listen to Schmidt reading to the Princess. Cabin 15 (Arbuthnot) - No sound. Arbuthnot is with MacQueen. Cabin 16 (Hardman) - Hardman is with Foscarelli. Cabin 7-8 - Enter cabin and Greta arrives. Michel catches Antoinette eavesdropping. Click on Michel with the 'shadow' icon. Antoinette follows Michel up to the baggage car. This opens the Restaurant car. Go forward in baggage car. Michel sends her out and locks the baggage car door. Go back to Calais coach. Enter your cabin 7-8. Greta enters and states that she was giving headache powder to Mrs. Hubbard. See the snow avalanche that blocked the train. The engineer puts on the brakes hard. Poirot falls off the bed. The passengers complain. Greta and Antoinette talk to Poirot who sprained his ankle. A scream and is heard. Go down the screen and click on door to peep out. Michel calls through Ratchett's door in French. Ratchett replies in French. See a train attendant climb on board. The call bell in Hubbard's cabin 11 is ringing. Click on door to peep. See Michel talk to Hubbard about an intruder. A pop is heard. Click on door again. See Michel reading in his chair at end of hall. A woman in red kimono walks towards the Salon. Click on Salon door and find out that it is locked. Go to Michel and talk to him. The woman in red kimono came out from one of the middle car - Hubbard's or Ratchett's. Talk to him again. Go back to your cabin. The next morning during breakfast, see the passengers complain about the train delay. Michel interrupts the discussion. There has been a murder onboard! I have accepted Monsieur's Poirot's challenge and will lead my own investigation. Talk to Poirot and learn about the murder of Ratchett. Poirot ordered the doors closed so that no one leaves. Convince Poirot to take command of the investigation. A challenge is given to Antoinette by Poirot. Accept the challenge to do it on your own with minimal help from Poirot. If you agree to help and not do your own investigation, the clues to some puzzles are given to you by Poirot. Examine Ratchett's body. Look at Ratchett's body. Check the pocket and take the pocket watch that stopped at 1:15. Check the pillow and get gun. Pick up the handkerchief with the letter H from the floor. Look at the side table and take the false teeth, thick tumbler with residue and smudge and metal statuette. Take the stub of a cigar, flat match, round match and scrap of burnt paper on the ashtray. Look at the suitcase on the overhead rack. Take the sleeping draught. Look outside the window. Check all items taken in inventory using the magnifying lens. Go down the room and check the coat. Get the matchbox with round type matches. Take the hat on wall with theRev:13:18 written on inside brim. Take the pipe cleaner on the floor. Check all items taken in inventory using the magnifying lens. Talk to Constantine about the body. Constantine states there are 12 wounds and at least 3 are capable of causing death. Some might be done by a right handed or a left handed person. Go next door and talk to Poirot. They summarized what was learned. Find items that could help read the burnt paper. 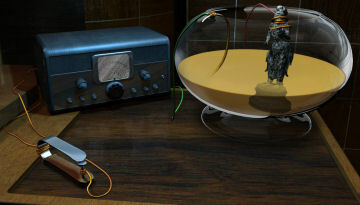 Poirot wants something to handle the burnt paper, 2 wire meshes to hold the paper in place and a source of heat. Jump to Restaurant car. Go to the buffet table and take the spirit lamp. Jump back to the Calais coach. Cabin 1-2 (Masterman & Foscarelli) - Door locked. Cabin 3-4 (MacQueen) - Door locked. Cabin 5-6 (Schmidt - Debenham) - Check the hatbox on the overhead rack and see the hat frame is not the right kind. Open and take the small latched box from Schmidt's suitcase. Check the box in inventory using the magnifying glass and see recipe cards. Open and take the dainty handkerchief from Debenham's suitcase. Check the handkerchief in inventory and see CMH embroidery. Cabin 7-8 (Ohlsson and Marceau) - Check the 2 locked suitcases. Check the hatbox below the overhead rack. Take the wire hat frame. Cabin 11 (Hubbard) - Check the hat box and suitcases on overhead rack. Take the chatty letter from the suitcase and read it in the scrapbook under documents. It is a letter from Maureen to her Mummy dear. Take the button from floor by the connecting door. Cabin 12 (Countess Andrenyi) - Door locked. Cabin 13 (Count Andrenyi) - Door locked. Cabin 14 (Princess Dragomiroff) - Check the hatbox on the bench. Take the wire frame. Check the suitcase at overhead rack. Take the puzzle box. Puzzle box - The aim is to open the box by sliding the panels on 3 sides. Click on a panel to get arrows. Click on arrow to move that panel. Short side panel - Slide top panel to the right. Slide bottom panel to the left. Long side - Slide panel up. Short panel - Slide top panel to left back to normal. Slide bottom panel to right back to normal. Short panel - Slide top panel left. Slide bottom panel to right. Slide bottom panel down. Top panel - Slide panel to left. The box is opened. Take the locket. Look at locket in inventory and see a picture of a young girl. Cabin 15 (Arbuthnot) - Door locked. Go back to cabin 14 and go through the bathroom. Click on door on the left. Check the suitcase and take the packet of pipe cleaners. Cabin 16 (Hardman) - Check the suitcase and take the leather sap. Open the small case on the bench and take typewriter ribbon. Cabin 9 - (Poirot) - Take the curling tongs from side table. Talk to Poirot. Burnt paper - The aim here is to heat the burnt paper to see what was written while holding the fragile paper in place. 1. In inventory, take burnt paper and click on the gear icon. Place burnt paper on the left frame. Do the same for the curling tongs. Click on gear icon at center and get curling tongs holding burnt paper. Click on the X at top right of the square to place the combined item in inventory. 2. Place a hat frame on the side table. 3. Place curling tongs holding burnt paper over hat frame. 4. Place another hat frame over the curling tongs holding burnt paper. 5. 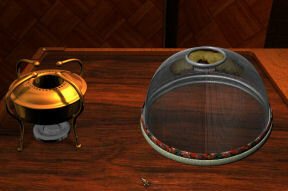 Place spirit lamp at left of table and use match to light it. Read: member - little Daisy Armstrong. Daisy Armstrong kidnapping - Colonel Toby Armstrong married Sonia, the daughter of Linda Arden, the famous tragic actress. They lived in New York and had one child, Daisy. 2 men kidnapped Daisy. The nursemaid was questioned. The ransom was paid. A tip led them to 2 men in a farmhouse. The 2 kidnappers were arrested at the farmhouse where they lived with an unidentified woman. Cassetti was the mastermind of the kidnapping. Jeffrey and Robert were sentenced to death but Cassetti vanished. The brothers tried to escape. Jeffrey was caught and the electric chair sentence was carried out. Robert escaped. The body of a child was found and identified as Daisy Armstrong. Sonia Armstrong delivered a premature child. Both mother and child did not survive. Toby in fit of despair shot himself. A body found floating in the harbor was identified by a relative as Robert Perkinson. The nursemaid leaped to her death and was later found to be innocent of any connection to the crime. Cassetti was known to have done other kidnappings and have killed the victims when police are involved. All of Poirot's instructions found in scrapbook are now completed to this point. Check the Challenge to see how you are doing in the game. Antoinette comments that it is cold now at the train. Michel approaches and states that the engineer said that the pipe under the train that carries steam to the cars is broken by a rock during the avalanche. Restore heat to the train. Cabin 10 (Ratchett) - Go to the open window and see Hardman looking at the footprints. Click on the shadow icon to follow Hardman. Automatically be inside the Athens-Paris coach. Talk to Matteo, the Athens-Paris train attendant that just came out of the common bathroom. Cabin 16 (vacant) - See a broken ham radio. Cabin 15 (Matteo) - Take the Morse Book from bench and Matteo Riverte's passport from the table. Cabin 14 (vacant) - Look at the bench and take the broken snowshoes under the bed. Check it in inventory. Cabin 13 (Constantine) - Check the coat on the wall and see that it is petite. Take Dr. Stavros Constantine passport from the table. Check the suitcase on the overhead rack. Take the announcement and check it in inventory. He is giving a speech about Antibiotics and Their Use in the Treatment of Primary Chlamydia-Induced Enteritis. Cabin 12 (vacant) - Take the torn letter from the floor. Torn letter - Piece together the torn letter by click-hold drop the pieces into the frame. Turn the pieces using the arrows at the bottom. Click drop them in place. Once completed it is placed at the scrapbook under documents. Cabin 11 (Michel) - Door is locked. Cabin 10 (Engineer) - Take the engineer's passport (Tayyip Sensoy) from the table. Cabin 9 (Klaus) - Check the suitcase on overhead bin and take Klaus passport (Klaus Herkensheimer). Enter the bathroom on the right when facing the exit door. Look down and open the cabinet below. Take the pliers. Cabin 5-6 (vacant) - Nothing here. Cabin 3-4 (Fireman) - Take the fireman's gloves from bench and fireman's passport (Abdullah Ozbizen) from table. Cabin 1-2 (Lucien) - Nothing here. The passports are entered under the passport icon in inventory frame. Engineer - Exit to outside using the door by Matteo. Walk outside to the front of the train. Enter the engineer's cab. Talk to Tayyip and find out that he can't eat. The dentist pulled all his teeth. He needs teeth. Antoinette gives him the false teeth. Yuck! Take the hammer on top of the tool box. He needs a replacement. Give him the leather sap taken from Hardman's suitcase. Pick up hammer. Take a lump of coal from the bin. Exit the engineer car. Look under the next car and see where the broken pipe is located. Obtain keys for the various train cars. Enter the Calais coach using the open window in Ratchett's room at Calais coach. Talk to Michel sitting at his regular position and get the baggage car key. Ask him for the Athens-Paris coach key. Jump to the restaurant car. Go to the other end pass the kitchen door and use the baggage car key on the door. Baggage car - Go forward and check every crate. Go to the crate with 'Two Pairs' label on it. Look close and Poirot's 'Quite Interesting' is stated. The crate is nailed shut. Use hammer taken from the Engineer to open box. The large nails were loose. Bound snowshoes - In inventory, pick up the bound snowshoes and click it on the gear icon. Place it on the right box. Click the gear icon and see that it separated. 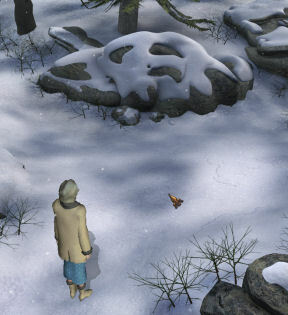 Click the X on the box of the snowshoes and the copper wire to place them in inventory. Go down and read the cargo manifest on the clipboard hanging on the wall. It shows that olive oil, honey and vinegar were loaded at Belgrade and that a special security package was loaded in Istanbul. Check the kegs across the manifest and see the oil, honey and vinegar kegs. Go down the screen and see the locked security door. Woods - Jump to the Athens-Paris coach and walk to the very back of the train. Exit the train and go right of screen to enter the woods. Go forward until the large rock at the center. Click the snowshoes on Antoinette. Go right and meet a wolf. Use the gun on the wolf to scare him off. Go to next screen and take the metal collection spout off the tree on the left. Go back to the large rock at the center (2 screens back). Go left now. There's a path above and to the left. Take the left path. The path goes left and right. Take the left path and take the other metal collection spout off the tree on the left. Go back one screen on the right. Go right and see that the path goes down and right. Go right and meet a wolf. Use the gun on the wolf to scare him off. Take the path that goes up to the snow bank. See a cliff ahead and another cliff will be on the left. Go to the cliff ahead and see something down the side of the cliff. Pick it up. Watch as Antoinette nearly ends her adventure. It is a steak knife. Look at the steak knife in inventory and see that it has the train logo carved into the handle. Go right and see a hut. Hut - The door is padlocked. Look at the metal bars and Poirot states that one of the bars is loose. Use the hammer on bar to get an iron bar. Use the iron bar on padlock to get a broken padlock. Pick up the attendant's uniform. Check it inventory and see that it is size petite and a button is missing. Remember that there was a button found in Hubbard's room. Turn the uniform and get a second pass key. Go to the other side of the room and take the stiletto from the chair. Examine the stiletto in inventory, turn it around and see that there's dried blood. There's also a smudge in the handle. Look at the stove pipe. Take the stove pipe using the pliers taken from the Cabin 7-8 bathroom of the Athens-Paris coach. Exit the hut. Use snowshoes on Antoinette. Go down twice to get to the cliff. Go down the screen. Go left and then down the screen. Go right twice to get to the big rock at the center. Go left until the train. Go forward to the car behind the engineer's cab. Look under the cab and place the stove pipe on the broken steam pipe. You might or might not need to use the fireman's glove but be sure that you have picked it up. Find Klaus the vinegar and olive oil he needs or I shall never gain access to the kitchen. Go back inside the train. Jump to the restaurant car and go to the kitchen. Chef Klaus needs vinegar and oil. Go to the baggage car. Go to the kegs across the Manifest on the wall. Use the metal collection spout on White Wine Vinegar keg cork. Use an empty glass on spout to get a glass full of vinegar. Do this for the Olive Oil to get a glass full of oil using the other metal collection spout taken from the woods. Go back to the kitchen and give them to Klaus. It is not enough. Klaus leaves to get more. Kitchen - Enter and take turkey baster from drawer under the pastries. Open the fridge and take the carafe of orange juice. Take the meat cleaver from chopping block. Go down to the stove and take the bowl full of batter. Exit tiny kitchen. Complete the timetable by questioning the suspects. Find out if all suspects have alibis for the night of the murder. Find out Ratchett's sleeping dosage on the night of the murder. Find out more about the person in the scarlet kimono. See if the alibis of the passengers hold up against scrutiny. Collect all reference prints from suspects. Take blank menu cards and the butter knife from the buffet table. How to get fingerprints - With the blank menu card, typewriter ribbon and also the paper napkins; ask any character for fingerprint and it will be automatically be taken. Open the inventory, click on the scrapbook icon, open 'suspects' and see the list of the fingerprints and passports taken. Klaus - Go to the baggage car and talk to Klaus to get his finger print. Debenham - Talk to Miss Debenham completely. Her fingerprint is taken. Her passport is in her cabin. Talk to her again. She is a governess in Baghdad. Count and Countess Andreyni - Talk to Countess and then the Count. She has never been to America. Get their fingerprints and their combined passports. He doesn't smoke. Lucien, the bartender - Talk to the bartender. His passport is in his cabin. His fingerprint is taken. He mentions that Klaus is upset because one of the steak knife is missing. Lucien makes a comment about passengers taking souvenirs from the train. <choke> Antoinette (or you) is freely taking things. Get a menu automatically. Take the ice bucket from the bar. Pull back and then take the punch bowl from the bar. Foscarelli - Talk to Foscarelli at other side of the salon. Get his passport. He smokes cigarettes. Get his fingerprint. Cabin 1-2 (Masterman & Foscarelli) - Talk to Masterman. Get his passport and fingerprint. Note the mention of letter and learn the dosage of the sleeping draught. He was never in America and smokes cigarettes. Now we know the sleeping dosage given that night. Check the suitcases on the overhead rack. Take the Love's Captive book from Masterman's suitcase. Look at it in inventory and see that it was taken from the Royal Military Library in Twickenham. Check Foscarelli's suitcase and take the chauffeur license of Foscarelli issued in New York in 1923. Cabin 3-4 (MacQueen) - Talk to MacQueen. Get his passport and fingerprint. He is the son of the DA that convicted the kidnappers. He left the door to the train open for Antoinette at Belgrade. There's a Ratchett letter in a safe at the security room. Take the 2 threatening letters from the briefcase by the door. Open inventory, click on scrapbook, select Documents and read the 2 threatening letters. Cabin 5-6 (Schmidt - Debenham) - Take Debenham's passport from the table. Talk to Schmidt. Get her passport and fingerprint. She has never been to America. She saw a train attendant come out of a middle compartment. The suspicious attendant was small, dark, has little moustache and has high pitched voice. Cabin 7-8 (Ohlsson and Marceau) - Take the bible from the table. Talk to Greta Ohlsson. Get her passport and fingerprint. She was never in America. She opened the door to Ratchett's room by mistake. She later checked the connecting door at Hubbard's cabin to find it locked. Check the suitcase from the overhead rack. Take the Coney Island in NY postcard. Examine it in inventory. 'In memory of a last happy day by the sea. Helena rode the roller coaster, but I could not'. Cabin 11 (Hubbard) - Talk to Mrs. Hubbard. Get her passport and fingerprint. There was a woman next door. There was a man in her cabin and she rang the bell button. The door was previously bolted. Cabin 12 (Countess Andrenyi) - Check the suitcases on overhead rack. Check the label of the suitcase. The hidden tag of the suitcases is HMK. Cabin 13 (Count Andrenyi) - The suitcase has nothing of importance. Cabin 14 (Princess Dragomiroff) - Take the passport from the table. Take the copper bracelet and get caught by the Princess. Get her fingerprint. Sonia Armstrong is her goddaughter and she is a close friend of Linda Arden. Sonia has a younger sister. Cabin 15 (Arbuthnot) - Talk to Col. Arbuthnot. Get his passport and fingerprint. He smokes a pipe. He saw the woman in kimono. Cabin 16 (Hardman) - Take Hardman's passport from the table. Michel - Talk to Michel about the button found in Hubbard's room. Talk to Michel about the murder. There was a chain on Ratchett's door. The window was open. He left to talk to Matteo at the other car. Get his fingerprint. Cabin 1-2 (Lucien) - Get Lucien's passport. Cabin 3-4 (Fireman) - Fireman's passport taken earlier. Cabin 5-6, 7-8, (vacant) - Nothing of importance. Cabin 9 (Klaus) - Klaus' passport taken earlier. Cabin 10 (Engineer) - Engineer's passport taken earlier. Cabin 11 (Michel) - Catch Hardman going through Michel's things. Get the small key from Hardman. Talk to Hardman. Get his fingerprint. He comes clean. He's a PI hired to protect Ratchett. He mentions that the snow is very bright when he talked about the case and the nursemaid. He tells where his real passport is located. Cabin 12 (vacant) - Nothing of importance. Cabin 13 (Constantine) - Talk to Constantine and get his fingerprint. Matteo - Talk to Matteo in his usual chair. He is a ham operator. After the avalanche, he found that the telegraph key was destroyed. He packed it carefully. He was on time at Belgrade and was already working. He was not the attendant seen coming in late. Get his fingerprint. Front of train - Talk to the Fireman and get his fingerprint. Engineer's cab - Talk to Engineer. He saw 'Matteo' get in late. Get Engineer's fingerprint. Go to Calais coach. You can enter through Ratchett's window. Cabin 16 (Hardman) - Look under the table and get Hardman's real passport, Hardman's real credentials from MacNeil Detective Agency in NY and Ratchett's letter. Check the Ratchett's letter in scrapbook and then documents. All of Poirot's instructions found in scrapbook are now complete to this point. All the passports and character fingerprints are now taken. Check the Challenge in the scrapbook to see how you are doing in the game. The timetable is also complete. Go to the back of the baggage car. Use the small key taken from Hardman on the lock. Safe: There's Ratchett's safe at the corner. 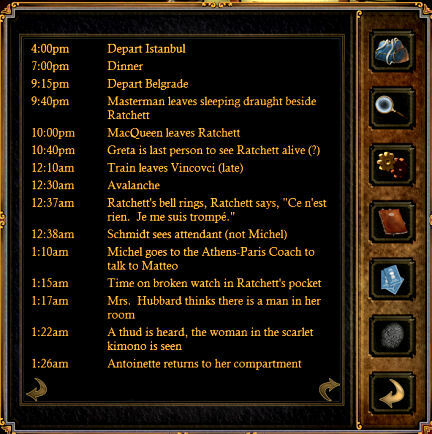 In inventory, look inside the hat of Ratchett and see the Rev. 13:18. Look at Greta's bible. Check the documents in the scrapbook. See the last sentence of the bible passage - '...and his number is Six hundred threescore and six - 666'. 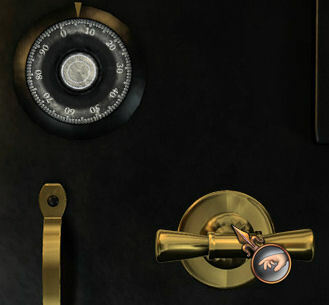 Turn by placing the cursor on the left of the dial of the safe (counterclockwise) and click to get 6 under the arrow. Place cursor on the right (clockwise) and click to get 6 under the arrow. Place the cursor on the left of the dial of the safe (counterclockwise) and click to get 6 under the arrow. The safe is opened. 'I think I heard a click.' Turn the handle and take Ratchett's confession. Read the confession in documents. It is signed Cassetti. Ratchett's crate: Go to the crate at other end of the room. Use the iron bar to open the crate. See a makeshift bed. Take the attendant's uniform. Check it in inventory. See no buttons missing and it is petite size. Look at the books at right side. How to take fingerprints from items. In inventory, take lump of coal and click on the gear icon. Place lump of coal on top left square. Take the hammer and place it on the second square. Click the gear icon to get coal dust. Place coal dust on top left square. Take turkey baster and place it on the second square to get turkey baster filled with coal dust. Use the turkey baster filled with coal dust on prints to be exposed. Use the sellotape on exposed fingerprint to lift the prints. Books - Use the turkey baster filled with coal dust on the top of the books. Use sellotape to get prints. Latch - Look close at the crate latch. Use the turkey baster filled with coal dust on the latch. Use sellotape to get prints. Security Door - Exit the room and look close at the door handle. Use the turkey baster filled with coal dust on the handle. Use sellotape to get prints. Small (snowshoe) crate - Look close on the snowshoe crate. Use the turkey baster filled with coal dust on the crate. Use sellotape to get prints. Empty crate - Look close at empty crate above the green food for the journey left of the car. Use the turkey baster filled with coal dust on the wood of the empty crate. Use sellotape to get prints. Cabin 10 (Ratchett) - Look close at the latch of the window. Use the turkey baster filled with coal dust on the latch. Use sellotape to get prints. Cabin 11 (Hubbard) - Look close at the door knob of the connecting door. Use the turkey baster filled with coal dust on the door knob. Use sellotape to get prints. Handle bar - Look close at the handle bars on the left. Use the turkey baster filled with coal dust on the handle bars. Use sellotape to get prints. Vase - Look close at the flower vase on the table. Use the turkey baster filled with coal dust on the vase. Use sellotape to get prints. To get prints from items in inventory. Take the turkey baster filled with coal dust and click it on the gear icon. Place it on first square. Take the item to be printed and click it on the gear icon. Place item on second square. Click the gear icon and see the item with exposed print. Take the item with exposed print and place it on first square. Take the sellotape and place it on the second square. Click the gear icon and take the lifted print. Lift prints from the Broken padlock, thick tumbler, stiletto and broken snowshoes. 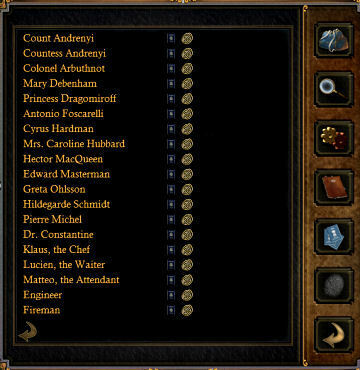 In inventory, click to open the fingerprint icons. Click on the microscope lens at center of frame to match the item's print below to the character print above. Scroll through the items or the character prints until all the items' prints are identified with a character. Books from Ratchett's crate - matches no one in the file. Rachette's crate (latch) - matches MacQueen. Security room handle - matches Michel. Small (snowshoes) crate - matches Foscarelli. Empty crate - matches Foscarelli. Window sill of Ratchett's cabin - matches Foscarelli. Doorknob of Hubbard's connecting door - matches Greta. Handle bar in Cabin 7-8 in Athens-Paris coach - matches Arbuthnot. Flower vase - matches Debenham. Broken padlock from hut - matches Matteo. Thick tumbler - matches Masterman. Stiletto - matches no one in the file. Broken snowshoes - matches Arbuthnot. Check footprint cast with all suspects shoes. Get footprint - Go outside under Ratchett's window. Look close at the footprint. Use the bowl full of cake batter on the footprint. Use the ice tongs to pick up the batter footprint cast. Combine the footprint cast and the ice bucket using the gear icon in inventory to get ice bucket with footprint cast. Match the footprint cast with male shoes found in the cabinet of the cabins. Go to all the men's room. Open the cabinet at the corner of the room. Use the bucket with footprint cast on the shoes found in the cabinet. Remember to do this to both shoes if 2 shoes are found. Go to Athens-Paris Coach and check the closet at: Cabin 1-2 (Lucien), Cabin 3-4 (Fireman), Cabin 9 (Klaus), Cabin 10 (Engineer), Cabin 11 (Michel), Cabin 13 (Constantine) and Cabin 15 (Matteo). Go to Room 1-2 at Calais coach. Use the bucket with footprint cast on the shoes and see that it matches the top shoes of Foscarelli. Check Masterman's shoes even though you have found a match. Continue to check at Cabin 3-4 (MacQueen), Cabin 13 (Count Andrenyi), Cabin 15 (Arbuthnot) and Cabin 16 (Hardman). All of Poirot's instructions found in scrapbook are now completed to this point. Search the train for any evidence that the suspects maybe lying about their pasts. Question the suspects about their pasts. See if anyone has a hidden motive or agenda. Find the owner of the monogrammed handkerchief. Go to the Salon car. MacQueen and Arbuthnot - Talk to the 2 men. Foscarelli - Talk to Foscarelli. Hubbard - Talk to Hubbard. Hardman - Talk to Hardman. He likes French girls. Debenham - Talk to Debenham. She's not in the mood. Go to the Restaurant car. Dr. Constantine - Talk to Dr. Constantine. Count and Countess - Talk to the Count about the passport. Talk to Countess and learn that she is Helena, the sister of Sonia Armstrong. Daisy Armstrong is her niece. Susanne is the name of Daisy's nursemaid and was French. The nurse is named Neudottor - New Daughter - Old Son - Ohlsson. The governess' name is Miss Freebody. Masterman - Talk to Masterman and learn that he was the batman of Toby Armstrong and valet in NY. He and Tonio worked together in NY. Princess - Talk to the Princess. She admitted that the handkerchief is hers. Greta - Talk to Greta. After confronting her with the Coney Island postcard, learn that she was the nursemaid of Helena, the sister of Sonia Armstrong. Schmidt - Talk to Schmidt. 10 or 15 years with the Princess? Klaus - Enter the kitchen and try to talk to Klaus. He is upset because someone stole his Black Forest Cake and he has to make a new one. I wonder who took his cake batter. Go to your room 7-8 at Calais coach. Check Antoinette's suitcase on the overhead bin. Take the infamous scarlet kimono. Look for Michel. The common bathroom at the Calais coach is locked. Go to the Athens-Paris coach and look for Matteo. He's not around. Enter Cabin 16 and see a man walk outside. Go outside and Antoinette looks for the man. Antoinette is kidnapped and taken to the hut. Escape the hut - Look under the bed. Take the Princess' parasol. Open the window and look out. Use the parasol on the padlock. Pick up the broken padlock. Use the snowshoes on Antoinette. Go back to the train by going at bottom of screen three times. Go left, down, right, right and left. Go left to the train. Go to Poirot and ask him about the ham radio. He says to talk to Barnaby using the ham radio. Use the ham radio to find out information about the suspects. Check Poirot's suitcase to get letter from Poirot's friend. Read it in documents in scrapbook. Jump to Athens-Paris coach. Go to cabin 16. Look close at the ham radio. In inventory combine the butter knife and the pliers to get bent butter knife. Combine bent butter knife, hammer and large nails to get makeshift telegraph key. Place the makeshift telegraph key on table. In inventory, combine copper wire with pliers (or meat cleaver) to get a cut length of copper wire. Use the cut length of copper wire on makeshift telegraph key. Place punch bowl on table. Use the carafe of orange juice on punch bowl. Place the statue in the bowl with orange juice. In inventory, combine copper bracelet with pliers to get bent copper bracelet. Use bent copper bracelet on bowl. Turn on the radio. There, the radio is ready to be used. Use the telegraph key. Automatically know Morse code since you have the book in inventory. Talk to Barnaby and ask all in the dialogue. Turn off the radio. Turn it on again, use the telegraph key and get answers from Barnaby. Chlamydia is an animal disease. Pierre Michel has no family. Cyrus Hardman has worked for McNeil Agency for 15 years. Linda Arden's children are fathered by Mark Gilbert. Count Rudolph Andrenyi is a Hungarian diplomat. Countess Helena Andrenyi's maiden name is Gilbert. Colonel Francis Arbuthnot served in Royal Northumberland Fussiliers in India. Mary H. Debenham is a governess. Hector MacQueen is what he says. Klaus is what is found. Matteo is what is found. Caroline Hubbard is a troublesome American. Greta Ohlsson is a nurse and missionary. Cook's name is Hildergarde Schmidt. Susanne the nursemaid's last name is Ferrier. Turn off the radio. Turn it on again and use the telegraph key. Toby Armstrong's served with the Royal Northumberland Fussiliers. Talk to Mary Debenham. She was the governess to Helena Armstrong. Go to Restaurant car and talk to Dr. Constantine. He is a veterinarian. Talk to Countess Helena for additional verification that she is Sonia's sister. Report to Poirot. In America is where all the nationalities are together. He will offer 3 solutions. Poirot is carried by Michel and Dr. Constantine. Poirot will reveal 3 solutions: one - crafted for Yugoslavian Police, second will reveal the crafting of a mastermind and the third one that even the mastermind doesn't know. 4. Through the door left unbolted by MacQueen. 6. Masterman confirmed the dosage of the sleeping draught. Second solution of work done by the mastermind. 3. Select all the names except Count Andrenyi, Cyrus Hardman, Mrs. Hubbard and Pierre Michel. Then select 'none of the above'. 5. All of these clues agree with the first solution. 6. When he said the snow was bright. For the solution selection, click on all the 3 dialogue selections. See the ending.